Sushi, a food that scares so many people; this includes my son. 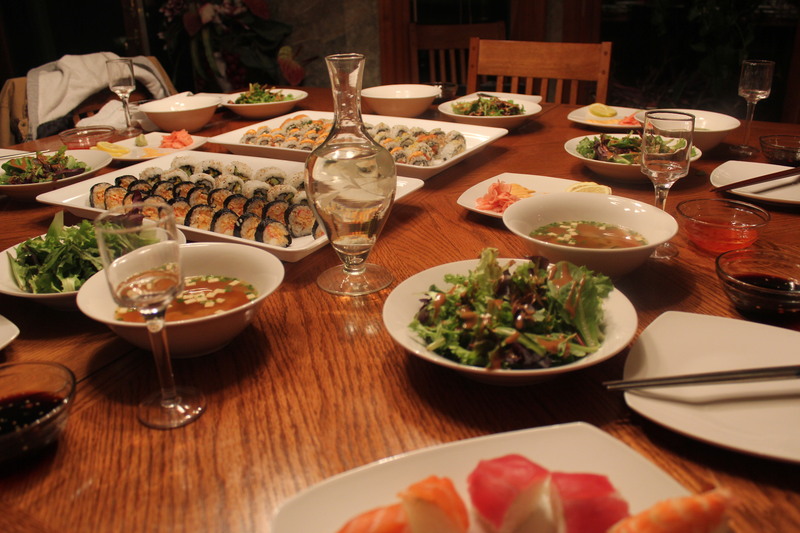 He asked if I would not mind doing a sushi tasting night for our Sunday dinner. David wants to start experimenting with new foods. Bravo for him asking to try something new, and for wanting me to help him develop his palate. He likes fish but has been reluctant to try sushi. So welcoming him to the exciting world of Japanese cuisine was a no brainer.. Of course I would, Mackenzie, our youngest daughter got an amazing gift from our longtime friends for Christmas. She has been holding onto this sushi making kit and it was time to break it out with her and create some delectable bites of sushi. I honestly wish I could have taken more pictures. 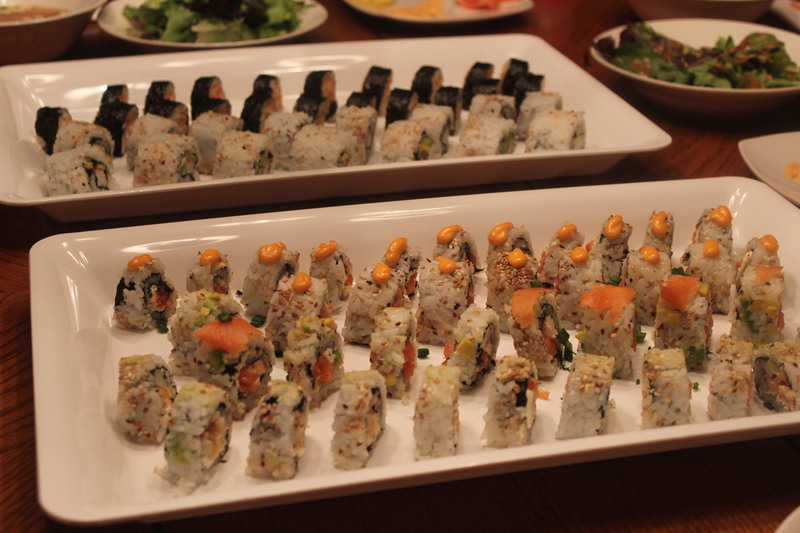 It was a very long process making the sushi tasting platters, and the end results were wonderful. Making sushi may be an adventure in the new and unusual, but the rewards are well worth the effort. I will give one recipe below, but the process of rolling sushi is something I am too new at and truly would not be able to explain although I will try. I went on youtube to watch people making sushi and this helped me tremendously. 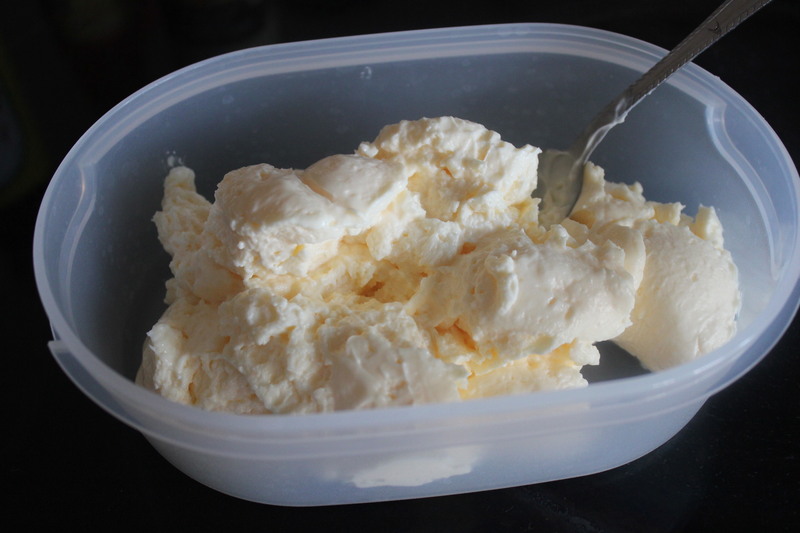 I was able to get some shots in the beginning and I will incorporate them into the recipe. But forgive me for not going much further. I served the meal with miso soup and a thai peanut salad with sake! 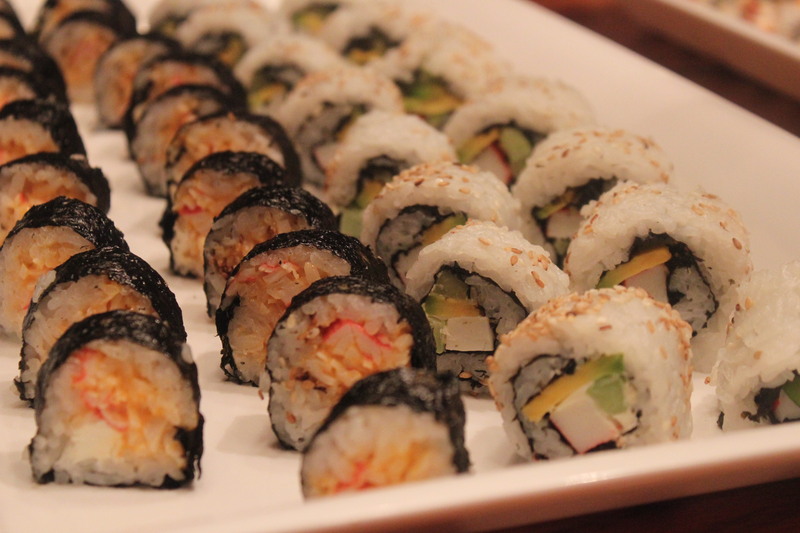 Sushi rice is very sticky rice, and it does not cook the same way as traditional rice. I would recommend getting a rice cooker for this if you don’t have one. Otherwise watch the instructions for the rice carefully; it will burn if you don’t. Short grain rice; rice is the most fundamental component of sushi, and Japanese style rice is quite different from American styles. While American rice is long grain, the Japanese use short grain rice. When cooked it is moister and clingier than long grain rice and therefore will hold its shape. Rice vinegar, this particular vinegar is diluted with water and used to moisten your hands and knives during preparation of the sushi. 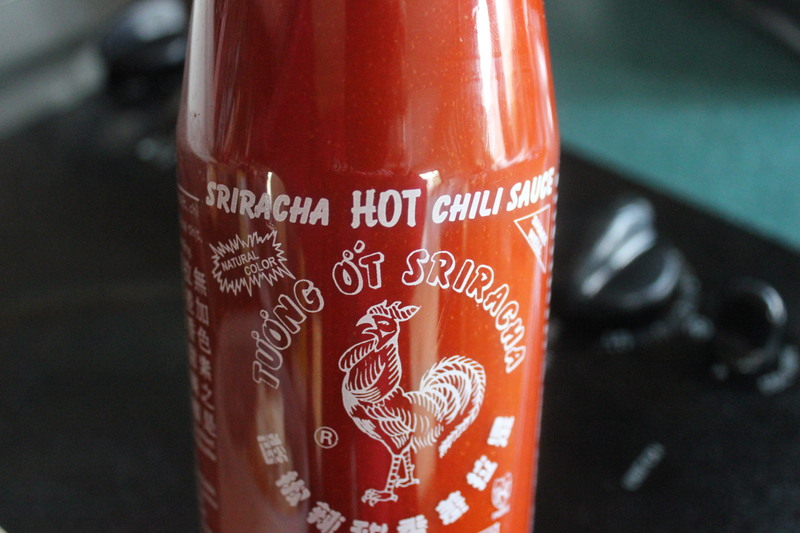 This prevents sticking and imparts a tangy flavor and aroma to the sushi. 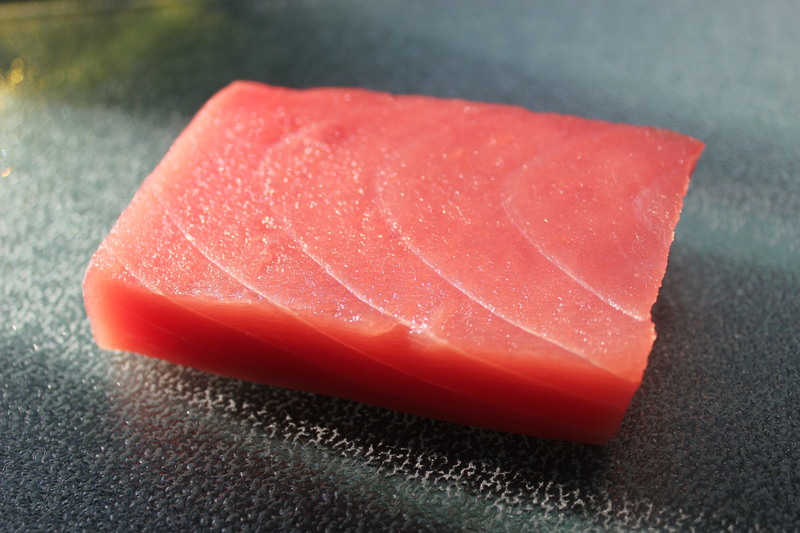 Sushi vinegar is specially seasoned vinegar that is prepared just for sushi. When mixed with the sushi rice it gives it the sheen and flavor for which it is famous for. Nori (toasted seaweed sheets) Nori is a nutritious natural food that is used to wrap certain types of rolled sushi. Nori should be toasted before using, just pass it over a heat source and it will become crispier. There are several types of nori out there. I know right who would have thunk it. Lol I don’t think the type of nori makes too much of a difference to us non professional. So don’t waste too much time on the various differences, just make sure you have enough to play with. 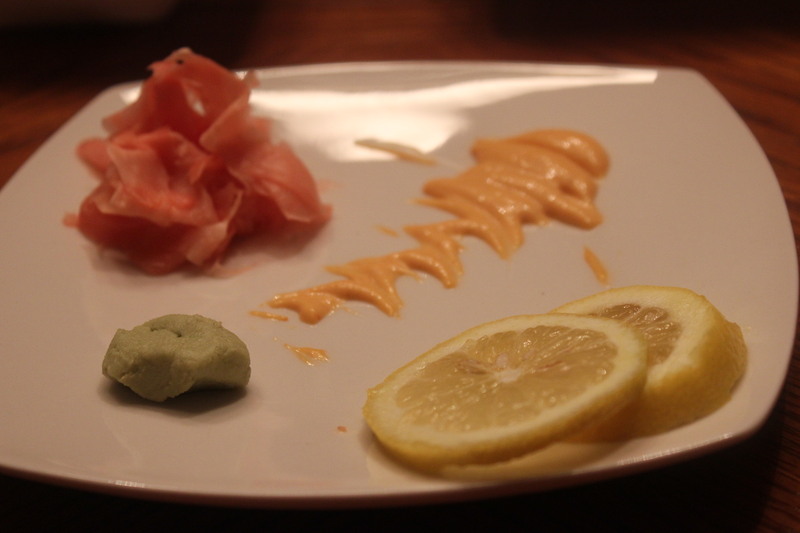 Wasabi is made from a knobby green root that grows wild along the banks of mountain streams. Wasabi grows slowly taking a number of years to mature. 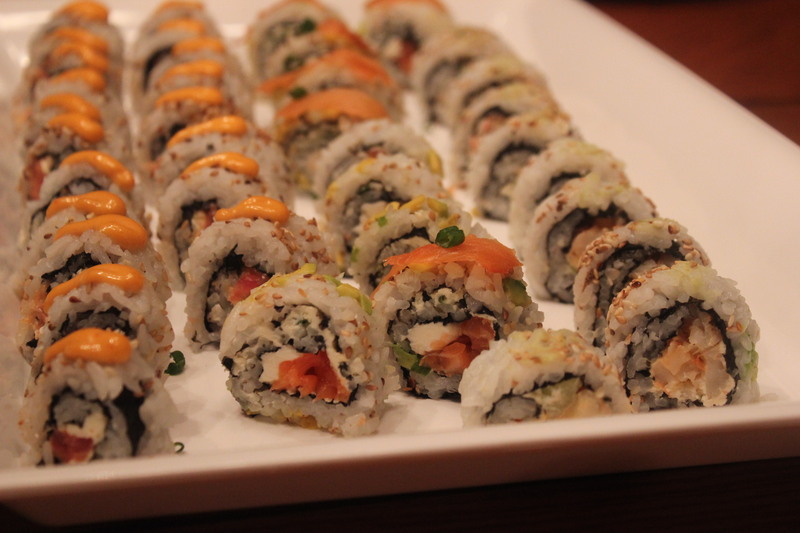 It adds a potent and spicy flavor to sushi. Pickled ginger is a cold sharp tasting condiment made from young ginger root. Freshly pickled ginger is marinated in seasoned vinegar to give it a delightfully pungent taste. (My husband kept feeding it to our granddaughter who loved the pickled ginger) Pickled ginger should be served cold and in a mound on the plate. It is traditionally served to use between different servings and at the end of the meal to cleanse the palate. Soy sauce, sushi is not complete without soy sauce on the side. It complements the delicate seafood and rice, Japanese dark soy sauce is preferred for sushi, it is sweeter and less salty than Chinese soy sauce, and has a bright flavor and aroma. The Japanese take great pride in the presentation of their food, I tried to keep that in mind, but this being my first time I think I could have done more. Also keep in mind if you are doing this for a significant amount of people you will need plenty of space in the refrigerator, and lots of time. I started making this dinner at lunch time. We ate at 7PM. 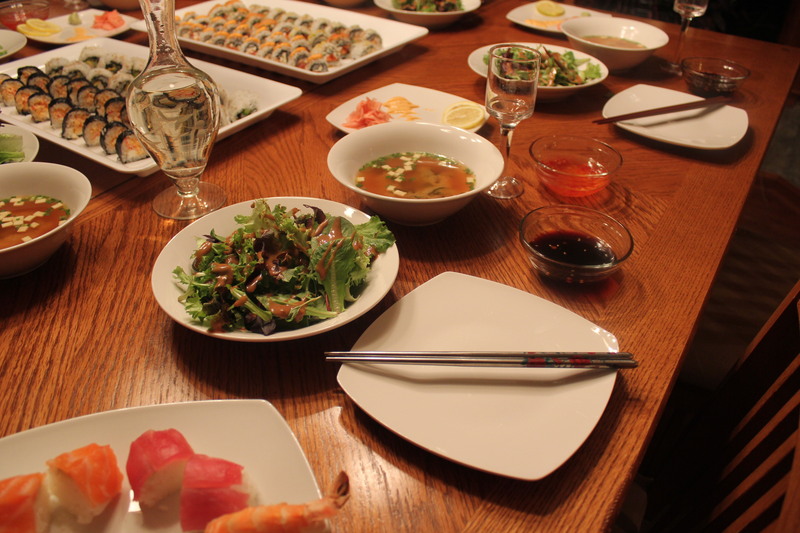 I made the following for our tasting dinner, Spicy tuna (Maguro), Smoked Salmon (Sake), Shrimp roll (ebi), California roll, and spicy crab (kani). When making sushi, please for the love of god make sure to get sushi grade fish. You are eating this raw! Grade “A” fish is not sushi grade. Head to a gourmet market that makes sushi on the premises, they will sell sushi grade fish for you, but to be on the safe side always ask if it is so you don’t have any nasty surprises after dinner. I will give the prep for the spicy tuna, I found making the inside out roll to be a bit easier. Sushi grade ahi tuna about 2 ounces will make two rolls. This roll is filled with a wonderfully prepared tuna in a creamy spicy sauce, the cream cheese balances out the spice in the buttery tuna, and I wanted the my son to have a pleasant first experience with the dinner. You will need a bowl of water/vinegar 6tbsp water to 2 of vinegar (remember the vinegar lends a nice flavor to the food and is essential to the preparation. 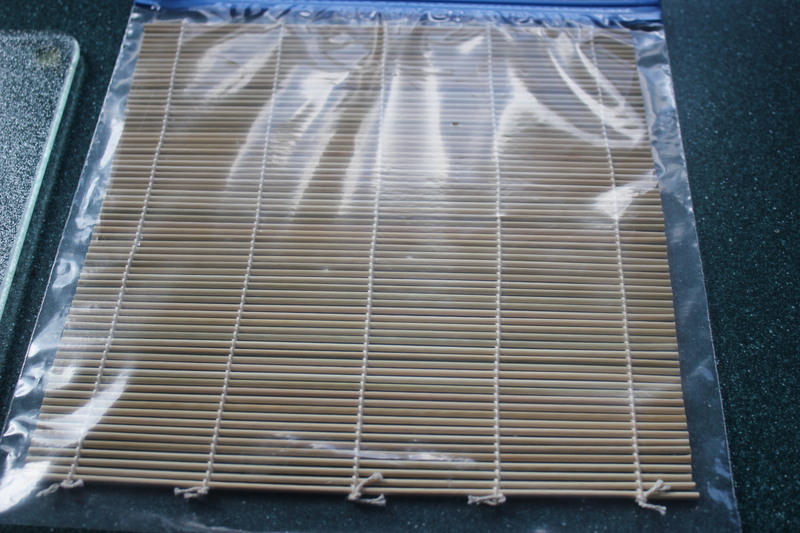 Bamboo rolling mat (cover it in saran wrap or place it in a zip lock bag. 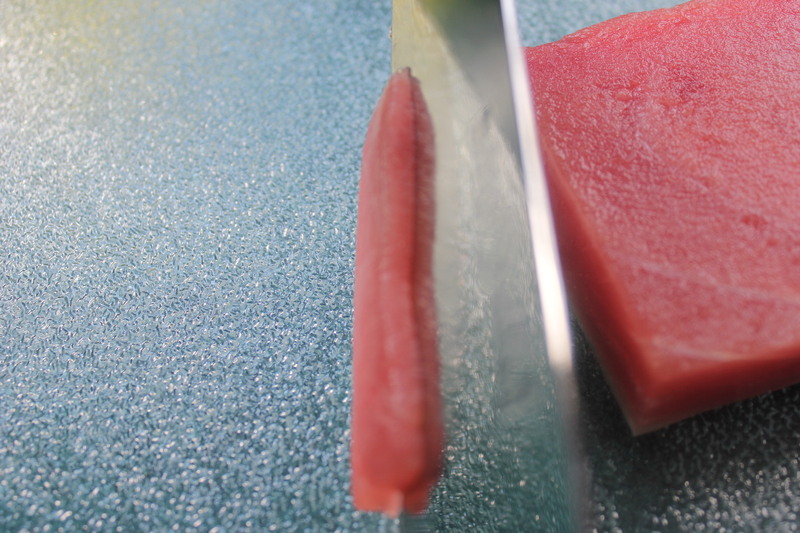 Cut the tuna in thin strips, turn and cut again. 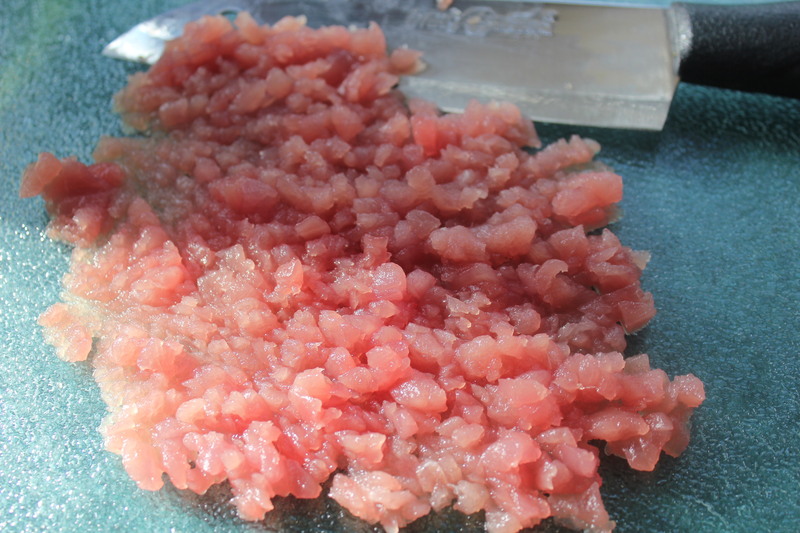 Continue to macerate the tuna with the knife until it is almost the consistency of hamburger. 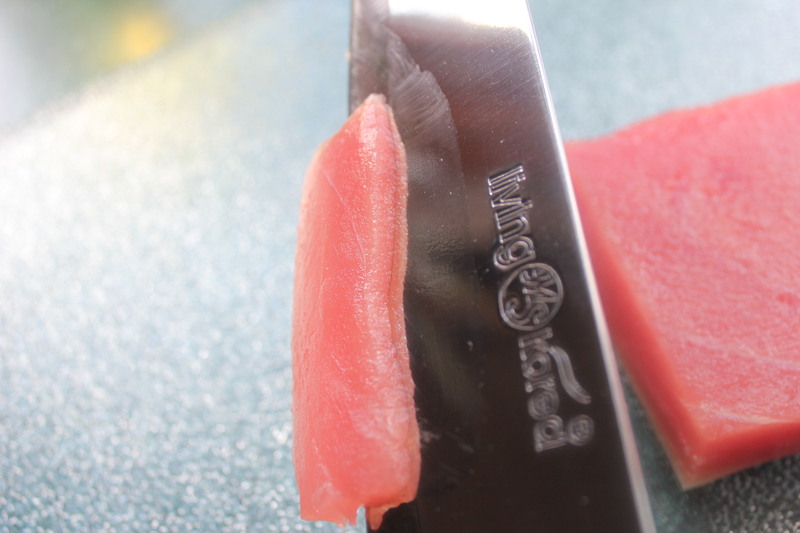 Use a really sharp knife, you don’t want to mangle this delicate fish and ruin the texture. Invest in a nice knife and you will be happy you did. 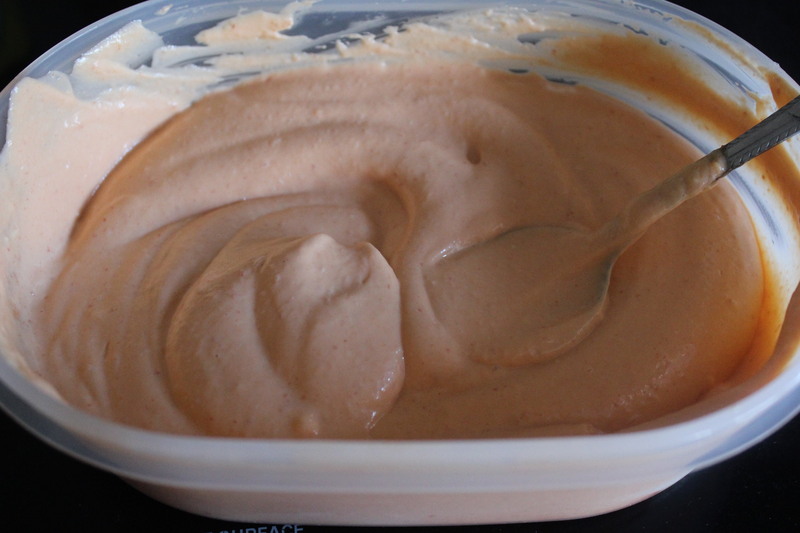 Take the mayonnaise and mix with the hot sauce until it has the amount of spice you would prefer. Mix the tuna with the sauce (don’t use all the sauce, the leftovers will be placed on top of the tuna and on the plate for presentation). Ok let’s do this, the rolling mat should be in front of you, make sure your wet towel is next to you on the preparation surface; place a sheet on nori on the mat shiny side down, with the long side running from left to right. Dip your hands in the water/vinegar bowl and scoop a large ball of rice (about ¾ cup) cover the entire surface of the nori with the rice, apply the rice evenly and neatly, this will be the outside of the roll. Sprinkle sesame seeds on the rice and flip it over. Run a streak of cream cheese across the nori from left to right In the middle of the nori, apply a bit o the wasabi alongside the cream cheese (be careful this is a very spicy addition to the roll) using a spoon, run a bit of the tuna along the cream cheese. To roll; grasp the bamboo mat win both hands, thumbs underneath and, pressing lightly on the fillings with the index finger of both hands, lift the mat so the edge of the nori closest to you meets the opposite and of the roll about an inch from the end of the nori. While applying pressure slowly roll the nori until there is no more showing. I would suggest looking online for the technique as trying to explain it is very hard. Sorry if I don’t have all the recipes on here it is a lot to do and I got all of them online by watching several youtube videos. 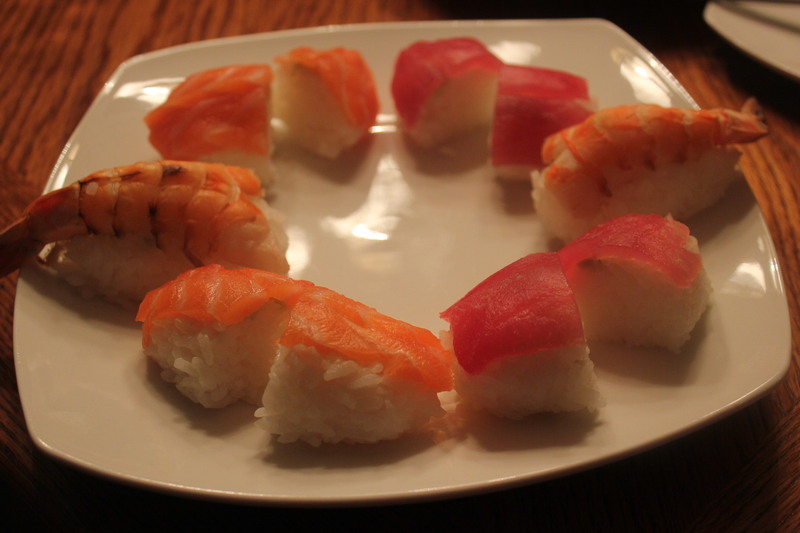 The first time I tried sushi, years ago, all I could think of was, “Why didn’t I do this sooner?” This beautiful post should get more people trying this delicious cuisine. I love sushi and honestly will be doing it more often! Thank you for the kind comment!